Zach Wilson spurned Boise State late in the recruiting process and signed with BYU. The Cougar QB has no regrets, but what about the Broncos? Provo • After several sleepless nights last December, 18-year-old quarterback Zach Wilson made the most important decision of his young life, and the most difficult telephone call. The senior at Draper’s Corner Canyon High who was set to graduate in the next few weeks called Boise State coach Bryan Harsin and decommitted to the program he had pledged to sign with six months ago. 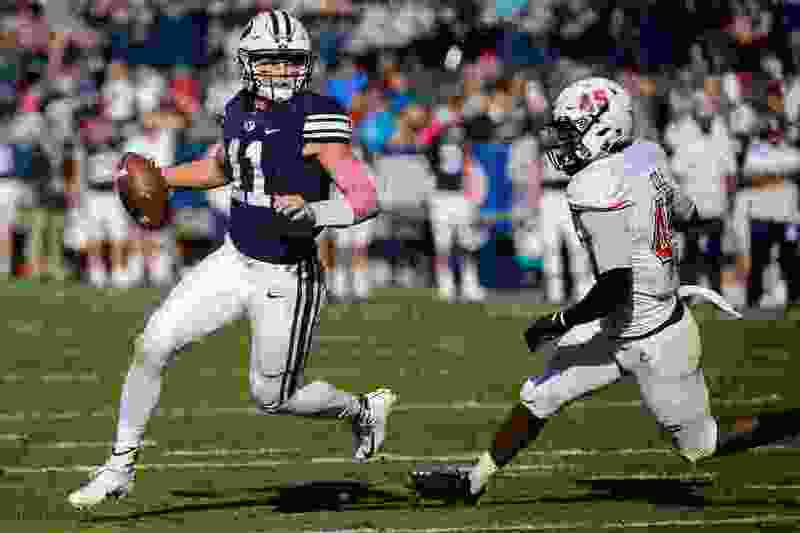 Wilson got the first two starts of his college career in the friendly confines of LaVell Edwards Stadium last month, defeating Hawaii and falling short against Northern Illinois. But in an ironic twist of fate, his first road start will come Saturday at 8:15 p.m. against those same Boise State Broncos he left at the altar nearly 11 months ago. Wilson, now 19, says he has no regrets about the decision, which isn’t exactly a news flash since he became the youngest player to ever start at QB for BYU and he’s quickly become one of the most beloved players on the team. The more interesting element to the story is that Harsin doesn’t seem to be holding a grudge, either. BYU and Boise State are certainly different, in plenty of ways, but especially in the way their football programs have performed the past two seasons. The Broncos are 6-2 and playing well again after going 11-3 last year and beating the Cougars 24-7 in Provo. BYU is 4-4 and seemingly on the precipice of another nosedive similar to last year’s overall 4-9 disaster. But Wilson is glad he came. Harsin said he offered Wilson relatively early in the process because he liked the way the youngster threw the ball, ran with the ball, and handled himself. He moved on long ago, he said. Coincidentally, another offensive player who could have a big impact in Saturday’s game, senior running back Squally Canada, also once committed to BSU before signing with Washington State and eventually transferring to BYU. Wilson said he doesn’t know, nor care about, what kind of reception he will get from Boise State fans. He said he approaches every game with a chip on his shoulder and the mindset that he has something to prove, and this one is no different. The Cougars are 0-4 on the blue turf. Grimes also has many ties to Boise State’s program, having coached the offensive line there in 2000, four years before his first stint at BYU. He’s friends with at least seven members of the current BSU coaching staff.